The story of Thanos has finally come to an end the only way it ever could: with Death. 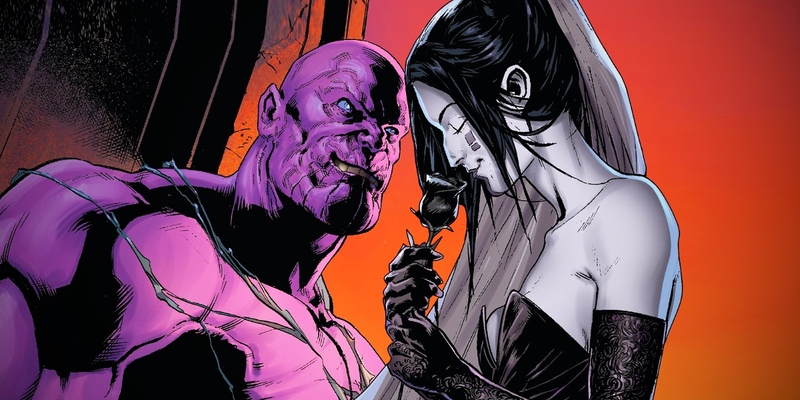 The comic villain spent his entire life trying to win the affection of the embodiment of death in the Marvel Universe, slaying countless millions in her name hoping only to hear her speak, let alone become his true bride. And in Thanos #18, the final issue of his solo comic series, Death finally blessed him with her voice. The final story arc has re-established Death as the villain's ultimate goal, telling the story of how "Thanos Wins" by murdering every hero, every Celestial, every living thing in Marvel's universe. Millions of years later, at the end of time, only a handful of fellow immortals stand at his side. Yet Death still refuses to come to meet him. Thanos has one last battle to fight, ending in total victory... and total defeat. The end of the series will stand the test of time as one of the greatest Thanos stories that could ever be told, proving why the Infinity War villain is one of Marvel's best. Those reading the comic know that Thanos actually did leave a good handful of living souls to keep him company at the end of Marvel's Universe. So even as the old King Thanos built a massive temple and statue out of the bones of the Celestial to his great love, Lady Death, he knew a few more deaths were required before hopefully winning her love by claiming all life in her name. He required help from his younger self (the Thanos who walks in Marvel's current universe) to bring down his last worthy enemy, the Silver Surfer who became Thor. Which all led to one final battle of Marvel's immortals, millions of years from now. King Thanos and Thanos won the day, but the battle made sure to leave nobody else alive. The immortal Hulk finally got to die, along with the last hope of the Surfer. Even the cosmic Ghost Rider (and former Punisher) was blown to pieces. In the end, only Thanos was left standing... in not one, but TWO time-displaced bodies. Which poses a bit of a problem. As Lady Death finally approaches "dressed for a wedding," each version of Thanos realizes at the same time: she can only have one husband. The Last Death She Demands is... Thanos Himself? It's a fantastic moment when Thanos finally discovers the real reason that he has never won Lady Death's heart, or been blessed with hearing her speak to him. Why he has killed an entire universe as a sacrifice and offering to her, yet it is still not enough for him to truly win her hand as a prize for his lifelong devotion. Fortunately, this Thanos is not millions of years older when he finally realizes that to truly be united with Death, he must die... "like everything else." That might seem like a dead-end for some conquerors, but this is Thanos we're talking about. And as old as King Thanos may be, he still shares the same determination and self-grandeur of his younger self. Only Thanos is worthy of killing Thanos, which is why he has brought his younger, stronger self to the end of the universe to finally kill him, so that he may be united with Lady Death. Now, whether that's purely for ego's sake or based on the idea that Thanos's immortality can only be overcome by his own power - directed against himself - isn't clear. Or all that important, once Thanos realizes what his true final fight will look like. And as Lady Death silently confirms that only one fight remains before she will finally be his, the two Mad Titans battle to the death - and to the loser go the spoils. Which poses the real problem of this final Thanos story. To be united with his lover in Death... Thanos must lose. And that dilemma is the very thing that leads to the only possible way for Thanos's story to end.